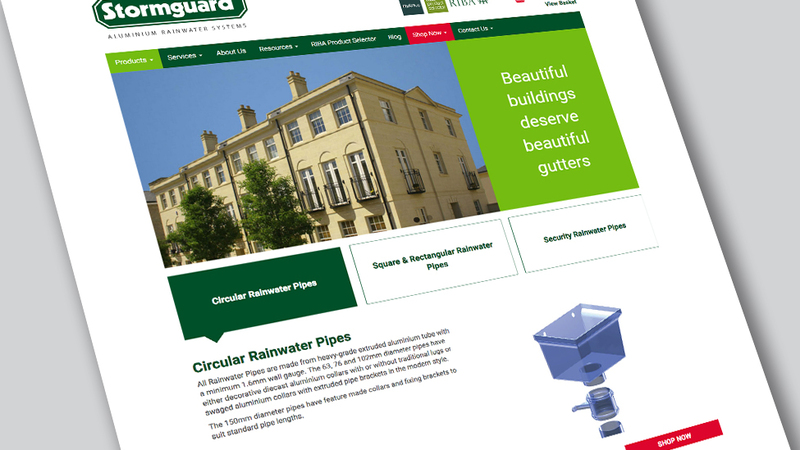 Our expertise in ecommerce website development helped Stormguard Rainwater Systems drive sales thanks to an improved user experience. Stormguard Rainwater Systems offers a range of pressed, extruded and cast aluminium rainwater systems. Their offering includes standard design and bespoke products for every type of industrial, commercial or domestic building. The company has maintained a reputation for quality in both design and manufacture with architects and contractors since the 19th century, and determined to continuously innovate and be ahead of competitors, they asked us to update their existing website. 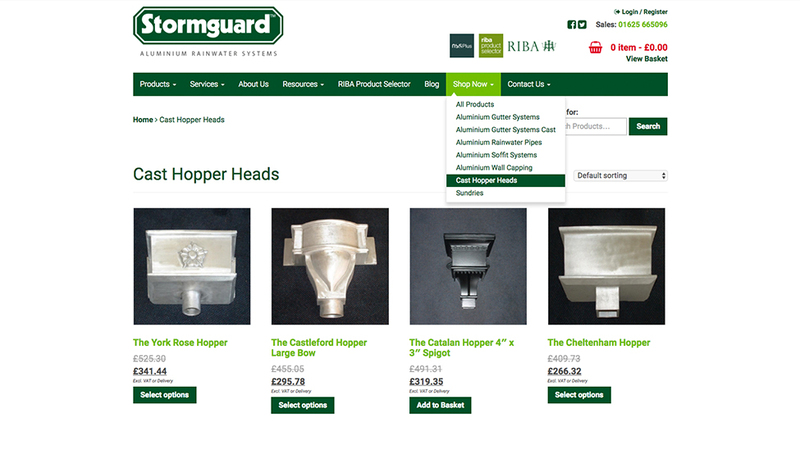 The new design had to include an ecommerce catalogue to effectively showcase their extensive product range, and also host information pages that would help position Stormguard Rainwater as experts in their sector. With recent studies revealing that shopping cart abandonment* rates continue to rise, our ecommerce website development solution focuses on ease of ordering and increasing speed of purchase by showcasing our client’s wide product range in a clear and appealing way. A scrolling slider featuring a selection of products makes the most popular ones quick and easy to find. The fully responsive design highlights product photography and features, and its simplified navigation improves the User Experience (UX) and User Interface (UI). Including a guest checkout also contributes to a fast and seamless experience as it lets customers complete a purchase without having to register their details. A streamlined CMS (Content Management System) allows our client to update with new content quickly and easily. We chose Woocommerce for our ecommerce website development solution, a very flexible tool that gives our client full control. It contributes to improved reporting and sales, allows for upsells and cross sells, and inclusion of embedded news, blog and links to our client’s social channels. Self hosting (non cloud based, client owns their own data). Product variables, with control over prices, stock and images, with size variations (e.g. small, medium, large, etc). Flexible shipping options with basket calculator. Our solution also includes a RIBA (the Royal Institute of British Architects) Product Selector, a building products library for the trade. (*) Adobe’s industry research reveals shopping cart abandonment rates by device: desktop (74%); tablet (78%); smartphone (84%). Source: econsultancy – How do we find a solution to the great shopping cart abandonment problem?.